I lost my mind for a couple of months this past spring. I purchased and planted, weeds. As with many insanities, mine started with the premise of a good cause. There isn’t even the word catalog anywhere on the cover. They aren’t in business to sell me something. They want to partner with me to restore North America. I had an open area in my permaculture windbreak which could use something, but I didn’t want large trees or bushes. So, in the interest of restoring North America, I purchased the “Butterfly and Hummingbird Kit for Moist Soils” from Prairie Moon. 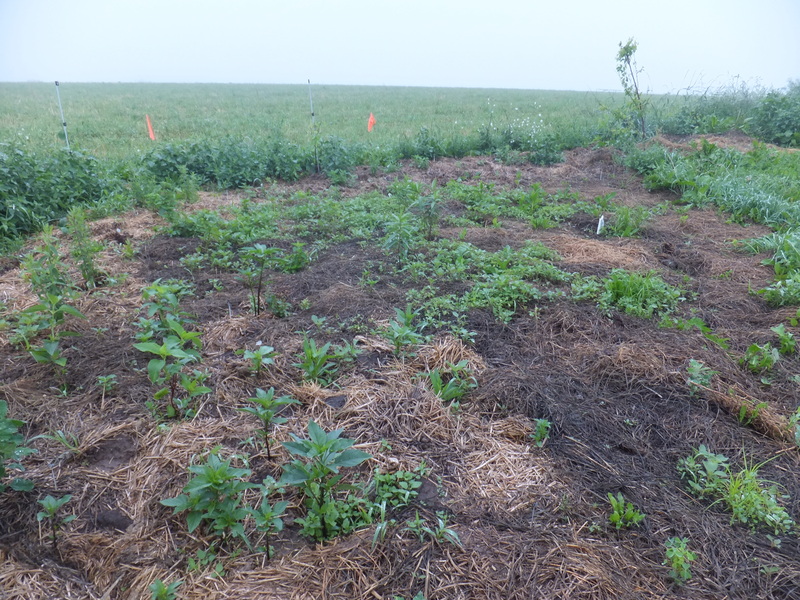 Below is a photo taken June 20th, a couple of weeks after planting and mulching. This next photo was taken August 10th. It was fun to see results so quickly. The flowers are already attracting many native pollinators. “Attracting Native Pollinators” is a book published by the Xerces Society. The Xerces Society works for invertebrate conservation. I read their book and I studied the Prairie Moon Nursery catalog and website, as well as the Prairie Nursery catalog and website. As a consequence of all this learning, I now see flowers. It amazes me every time I learn something new and my vision changes. We see with our brains, not our eyes. So I couldn’t help but notice this huge colony of pink flowers along Highway 23 between Darlington and Mineral Point. 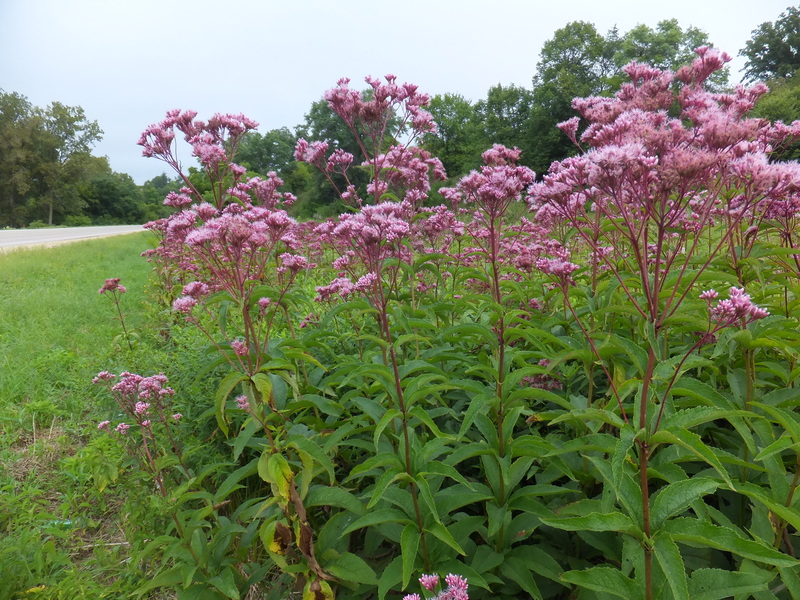 It’s Joe Pye weed, a great flower for native pollinators. The top photo in this post gives you a closer view. And I realized how crazy it is for me to plant wildflowers thinking I’m helping the native pollinators. If I really wanted to help the pollinators, I would start a movement to stop cutting and spraying herbicide along the roadsides. There are acres and acres of excellent habitat alongside every road. 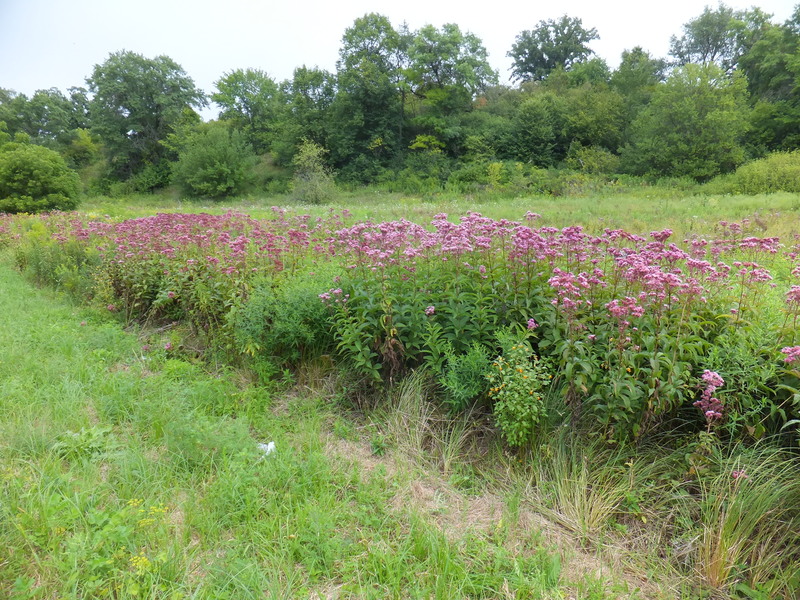 This entry was posted on Monday, September 8th, 2014 at 11:42 am and is filed under Curious nature, Curious weeds. You can follow any responses to this entry through the RSS 2.0 feed. You can leave a response, or trackback from your own site. I agree with you on the spraying! A month ago my neighbor and I were doing our daily morning walk and a county worker drove past spraying the roadside. Not only was I upset he was spraying, but that we had to breath it while we walked. Conversely, what do you think about the growing wild parsnip problem? It’s so invasive, not to mention the horrible rash one gets from it. I don’t remember this plant from my childhood. Why is it so prolific now? Is this why counties are cutting and spraying, and if so is it effective in controlling the parsnip? 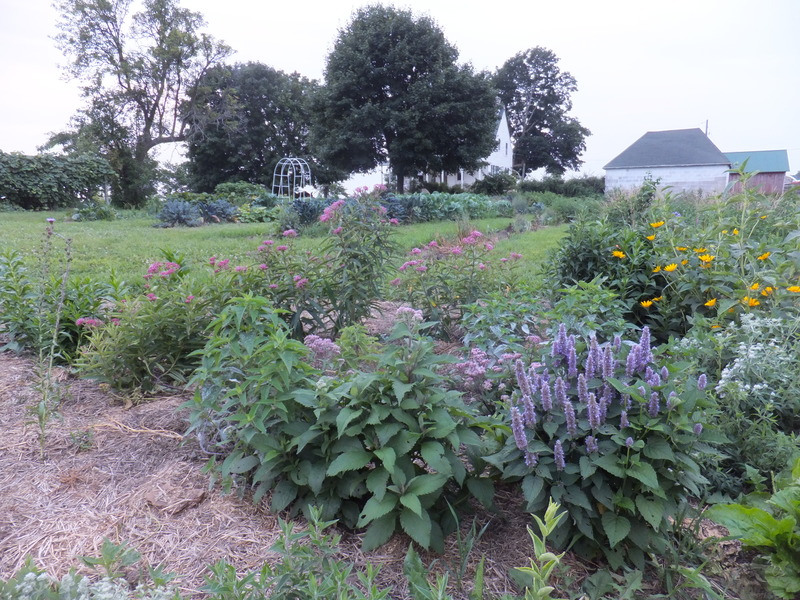 Hey, your pollinator garden is really beautiful! According to “The Forager’s Harvest,” wild parsnip is exactly the same as the garden parsnip, just escaped into the wild. You can eat the root just like you would a normal parsnip. It is invasive, and thrives. There are plenty of herbicides which would wipe it out, but also wipe out everything else but the grass. So the cure may be worse than the affliction. Mowing probably won’t control it unless done every year and fanatically not letting it go to seed. It’s a biennial, so the first year rosette which is low to the ground won’t even be touched by mowing. The second year sends up the tall stalk and flowers and seeds.